This research is aimed at providing improved adequate domestic water source(s) and better sanitation through the use of research. It will identify and classify water and sanitation perspective and disease associated with water and sanitation from people in the study area. The study adopted the case study method. Questionnaire, literature review, site observation, and focus group discussions were used as data collection tools. All households have access to different water sources with seasonal availability problems, as some respondents were quick to say ‘during the dry season water becomes scarce and has to go for an alternative source in either surrounding area or public facilities’. The survey revealed that all have access to both improved and unimproved sources of water with respect to their different sources. Only 10.9% of households surveyed indicate not having toilet facility but engage in the bush, open field and/or neighborhood facility. This shows that 89.1% of households have access to toilet facility and 100% has a source of water used in the type of toilet. Observations were done at the toilet facilities to explore the sanitation practices employed by the different households, 42.3% of households were of apparently good and clean whereas 57.7% of households have the unsatisfactory environment. Water is necessary for all forms of life and plays a vital role in regards to the promotion of public health and the socioeconomic development of human communities. Water is the source of life, the most precious and important of all natural resources, without which the human species cannot survive . Access to safe water is a human right . The availability of safe water and adequate sanitation is critical not merely for health reasons, but also for economic development . sanitation thus access to, and use of, excreta and wastewater facilities and services that ensure privacy and dignity, ensuring a clean and healthy living environment for all . Water supply and sanitation are among two of the most important sectors of development . Water scarcity is a worldwide problem, it is also a situation in Sierra Leone, where women and children walk for hours to collect water from shallow and unprotected ponds, unprotected wells, and rivers, and in some areas they share the same water sources with their animals . Water and sanitation coverage in Sierra Leone is estimated at 57% and 13% respectively  of the 5.9 million inhabitants, which gives an indication that efforts are still needed to improve on water and sanitation facilities. It is quite easy to understand how necessary water is, but it is believed that unsafe drinking water is as risky as water scarcity. Thus, people are easily exposed to waterborne and sanitation-related diseases . Consequently, poor access to improved water and sanitation has adverse effects on the economic well-being of the community. Bo city, the Southern regional capital of Sierra Leone has witnessed remarkable expansion, growth and developmental activities such as buildings, road constructions, deforestation and many other anthropogenic activities . In this regard, Bo has been facing a lot of problems such as poor water sources and lack of improved sanitation practices. The current water supply system in the municipality does not have sufficient capacity to cope with the demands of the people. The communal standpipes in some areas do not receive water for a longer period. One of the major challenges in this area is infrastructure failure and the municipality does not have staff capacity or financial resources to implement such systems quickly, hence the majority of residents do not have access to safe water and sanitation services. The aim of the study was to provide improved adequate domestic water source(s) and better sanitation through the use of research and advocacy. The main objective of the study was to identify and classify water and sanitation perspective from people in the study area. Bo City, the second largest city in Sierra Leone (after Freetown), is the Headquarter of Bo District and the Provincial capital of the Southern Region. It is situated approximately 155 miles (250 km) Southeast of Freetown. Bo was chosen as the study area based on its apparently rapid growing population thus will impact the available water and sanitation facility (Figures 1 and 2). Figure 1. S/L map showing section Bo district of the study area (Coordinates: 8ÃÂ°00'N 11ÃÂ°40'W). Figure 2. Local map showing sections of the study area. Both Qualitative and Quantitative methods were used in the study. Five locations (North, South, East, West, and Central) of Bo city were targeted. The target for sampling is the households (head), having 51,074 households with a population of 174,369 (Population and Housing Census, 2015). Based on the formula, the total number of houses that were selected for the study was 175 houses, and 35 houses were randomly selected based on location. The use of a questionnaire, literature review, site observation and telephone interview as a data collection tools. In parallel with the literature survey, a collection of basic background data were obtained from journals, water reports, approved thesis from the internet, textbooks, magazines, gazette, and internet related materials. For site observation collection of data were done by taking photos and for telephone interviews data were collected through notes writing. Focus Group Discussions (FGDs) with identified groups in the study area to converse and discuss issues based on a checklist prepared for the purpose. The field study was limited in that it focuses on water for domestic consumption and sanitation related to personal hygiene in households. Statistical package of frequencies, percentage, bar charts was used for the data analysis. The software used for this research will include, Microsoft excel and Special Package for Social Scientist (SPSS). Ethical issues were considered during the research work. These revolved around those people that were an integral part of the research process. It was necessary to consider ethical consideration in such kind of research work, as research was carried out by direct interaction with household heads and different related people for the data collection. The relevant persons for the required data collection were informed about the aims of the study and their participation was voluntary. Five enumerators were employed to carry out the research with prior informed consent. The two major types of water sources that exist in the City are hand-dug wells and borehole pumps. The evidence is shown in Table 1a and 1b that hand-dug well is the main source of water for domestic use. Two types of hand-dug wells were identified during the study (i.e. traditional and modern). Table 1A & B. Available water sources and an alternative source (source during dry season). Traditional hand-dug wells were unlined, unimproved and unprotected holes, generally, less than 15 meters deep, that are hand-dug with picks and shovels into the water table. These wells are very common in the study area, and they are subject to contamination by various means, often yielding water of unacceptable quality, and they are a continuous potential health risk to users (respondent view). In contrast to modern type which is well protected, improved and structured. Of the identified water sources, water was available in all the sources at the time of the research as in Table 1a. All households have access to different water sources with seasonal availability problems, as some respondents were quick to say ‘during the dry season water becomes scarce and has to go for an alternative source in either surrounding area or public facilities’. Respondents reported the need to use an alternative water source (Table 1b) due to seasonality (i.e December to April), and in all these cases the secondary source was farther than the primary source and most cost them time and money to acquire the pipe running water sources. The water sources likely to be of suitable quality, or “improved”, are: a public tap; a borehole pump; a protected handdug well; and rainwater. Water sources that are “unimproved” are an unprotected hand-dug well, and surface water . Households have an alternative source of water especially during the dries, it was also noted that because the research was carried out during the rains, the supply of public tap was regular and households could also source water from rain harvesting. In addition many will go for an alternative source provided their sources get dried up, turbid or contaminated (Figure 3). Figure 3. Shows eight different water sources identified. In Serra Leone, like in most African countries, women and children generally bear the responsibility of collecting water for their families . This means that when water systems break down, women and children are the ones that suffer most since they then have to travel far to search for water for household use. The survey results revealed that women are responsible for carrying water, whilst most of the burden rests on children (Figure 4). Figure 4. Improved and unimproved source of water. Without a clean, safe toilet close to home, people are forced to live in an unhealthy and unpleasant environment. Having to go to the toilet in the open or sharing facilities with hundreds of others is extremely embarrassing and unsafe for everyone's health. Sanitation may be as cheap and simple as a protected pit latrine or as expensive and complex as a flush toilet with sewerage. Sanitation gives people, especially women and girls, dignity, privacy, and safety. Clean, safe toilets and hand washing facilities at home help children's ability to learn. Improved health helps people earn a living. Effective sanitation also means the environment is safer and cleaner for all activities children can play, food can be prepared safely and homes can be kept cleaner . The global definition of an ‘improved’ sanitation facility is one that hygienically separates human excreta from human contact . A number of sanitation solutions fall within this category: the flush toilet, piped sewer system, septic tank, and flush/pour flush to pit latrine, ventilated improved pit latrine, pit latrine with slab and a composting toilet [10-14]. However, similar to the definitions for water, these are safe to varying degrees; the WHO has recently estimated that effective sewer connections provide an estimated 69% reduction in diarrheal disease compared to an estimated 16% reduction from improved sanitation without sewer connections-although this is based on limited evidence and should, therefore, be considered preliminary . The common sanitation facilities available at the households are pit latrines followed by households that have both pit and flush latrine as shown in Figure 5. The common pit latrine is usually a hole dug in the ground, with a cover slab made of concrete cement, mud and some sort of structure built for privacy [15-17]. 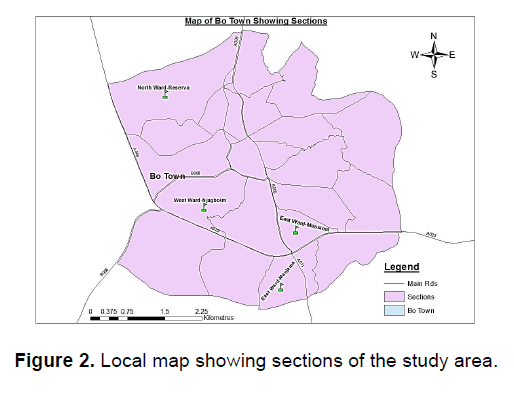 Only 19 (10.9%) households surveyed shown in Figure 5, not having toilet facility but engage in the bush, open field and/or neighborhood facility. This shows that 89.1% of households have access to toilet facility and 100% have a source of water used in the type of toilet shown in (Figures 5 and 6) respectively. Figure 5. 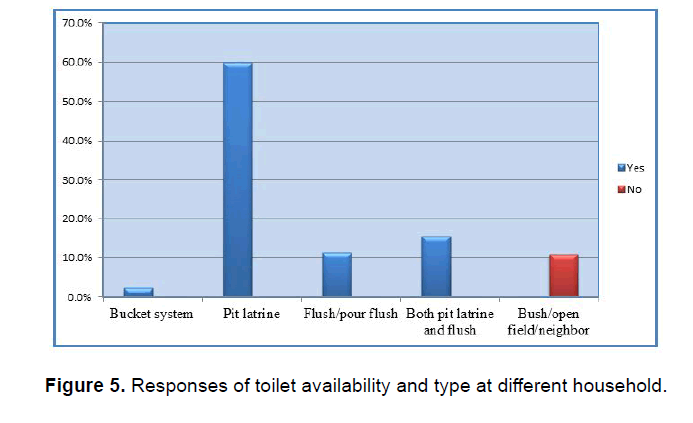 Responses of toilet availability and type at different household. Figure 6. Show eight available toilet types (there was a limitation in photographing some facilities inside the households). Simple pit latrines are considered to be an improved sanitation technology because they are private and hygienically separate human excreta from human contact . During the survey, 57% of the households use water and soap after toilet which shows a kind of sanitation practice employed by the respondents. Observations were done at the toilet facilities to explore the sanitation practices employed by the different households, 42.3% of households were of good and clean sanitary environment whereas 57.7% of household have the unsatisfactory environment. Lack of safe water, sanitation and hygiene remain one of the world’s most urgent health issues. Almost one-tenth of the global disease burden could be prevented by improving water supply, sanitation, hygiene and management of water resources. Better managing water resources to reduce the transmission of vector-borne diseases (such as viral diseases carried by mosquitoes) and to make water bodies safe for recreational and other uses can save many lives and has extensive direct and indirect economic benefits, from the micro-level of households to the macro-perspective of national economies . Lack of access to safe water and sanitation education are the root causes of poverty as it is the poor, especially women and children, who suffer most due to poor living conditions and diseases (respondent view) (Figure 7). Figure 7.PeopleÃ¢ÂÂs awareness with respect to the different diseases associated with water and sanitation. Source: AuthorÃ¢ÂÂs Field Sample Survey, 2017. By the most recent estimates, diarrhea is the leading cause of death among children under five years in Sub-Saharan Africa, resulting in 19% of all deaths in this group  (Figure 8). Figure 8.Household diseases associated with water. Source: AuthorÃ¢ÂÂs Field Sample Survey, 2017. Most of households suffer from diseases such as cholera, diarrhea, typhoid, and malaria. Children and women are most vulnerable as a result of unimproved water source and poor sanitation practices. In both low and middle-income countries, diarrhoeal disease is the second leading cause of morbidity and mortality among children under the age of and the leading cause of death in sub-Saharan Africa  Approximately 1.5 million children under the age of five died of diarrhoeal disease in 2012 [19,20] (Figure 9). Figure 9.Category of people suffers from water and sanitation diseases. Source: AuthorÃ¢ÂÂs Field Sample Survey, 2017. Based on the results presented above, all households have access to different water sources with seasonal availability problems, as some respondents were quick to say ‘during the dry season water becomes scarce and has to go for an alternative source in either surrounding area or public facilities’. Respondents reported the need to use an alternative water source due to seasonality, and in all these cases the secondary source was farther than the primary source. The survey revealed that all have access to both improved and unimproved sources of water with respect to their different sources (Figure 7). Only 19 (10.9%) households surveyed indicate not having toilet facility but engage in the bush, open field and/or neighborhood facility. This shows that 89.1% of households have access to toilet facility and 100% has source of water used in the type of toilet Observations were done at the toilet facilities to explore the sanitation practices employed by the different households, 42.3% of households were of good and clean sanitary environment whereas 57.7% of household have unsatisfactory environment as shown in Table 1. However, the general environmental sanitation condition in Bo is not up to expectations. Individuals, households, and businesses (commercial entities) do not tend to prioritize environmental sanitation. As such, people have a poor attitude towards sanitation. In the future, the research will be looking at the quality of the water sources with thorough experiment approach. Water and sanitation perspective: progress report on the implementation of regional and international agendas, including nepad and other special initiatives, in the southern africa development community (sadc) sub-region. 2015. Acheampong PT. Environmental sanitation management in the kumasi metropolitan area (doctoral dissertation). 2010. AMCOW country status overview: water supply and sanitation in sierra leone turning finance into services for 2015 and beyond. Cantrell BL. An evaluation of a water, sanitation, and hygiene program in rural communities outside of port- au-prince, haiti. 2013. Conservation ontario: wellhead protection areas. 2009. Dungumaro EW. Availability of domestic water and sanitation in households: a gender perspective using survey data in south africa. 2007. Encyclopedia of earth. water profile of Sierra Leone. 2008. UN-Water Global analysis and assessment of sanitation and drinking-water (GLAAS). 2012. Mills JE, et al. The impact of water, sanitation and hygiene on key health and social outcomes. 2016. Mnisi R. An assessment of the water and sanitation problems in new forest, bushbuckridge local municipality, south africa. 2011. Musa JA. Water sanitation and hygiene in sections of bo district sierra leone: problems, challenges, and recommended solutions. 2014. Rowan M. An assessment of the water and sanitation problems in new forest, bushbuckridge local municipality, south africa. 2011. Tezera BS. 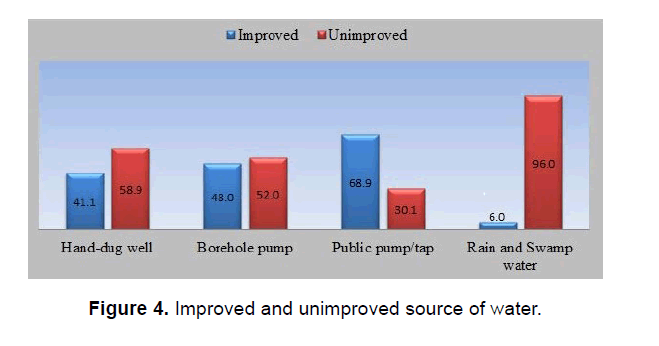 development impacts of poor accessibility of potable water supply and basic sanitation in rural ethiopia. 2011. The national water and sanitation policy. 2010. WASH report: UNICEF Sierra Leone. 2010. Water supply, sanitation and hygiene (wash) assessment of an integrated wash component for the steward program (nov. 2012-march 2013) prepared by water and sanitation for Africa. Weiyu Yu, et al. A global perspective on drinking-water and sanitation classification: an evaluation of census content. 2016. WHO/UNICEF. Joint water supply, sanitation monitoring programme. Progress on drinking water and sanitation. World Health Organization. 2014. WHO/UNICEF. Joint monitoring programme (JMP, 2012-2017): Water supply and sanitation website. Joanna, et al. The impact of water, sanitation and hygiene on key health and social outcomes. 2016.